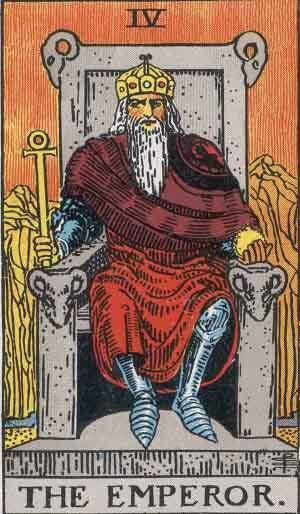 The Emperor is, in contrast to The High Priestess and The Emperor, a masculine card. Presented as a bearded King upon a throne, The Emperor shows his stability and need to rule. He holds an Ankh and an Orb; core symbols of Egyptian theology. First impressions of The Emperor remind us of mythological kings, sat upon their throne, bearded and crowned. The Emperor represents authority, fathering, and regulation. Past – The Emperor in the Past position represents a strong past paternal presence. A good teacher or father who guided you who taught you lessons that still come in handy today. The Emperor is conservative with traditional values. Maybe you were brought up in such a household, or taught by somebody who paid attention to the rules. Present – The Emperor in the present position represents a current paradigm of rules and regulations, or a strong and well known person. Look to somebody who can guide you down a new way of organisation and thinking. It’s also possible you may meet somebody famous, or somebody you used to idolise as a role model. Future – The Emperor in the future position suggests a level of stability or a change of mindset to perceived stability. Your political views may change, or you may consider working ‘by the book’ instead of trying new techniques. You may also be working in the same field for a long time, but this isn’t a bad thing; you’ll learn a lot and becoming an expert at the techniques you use. Work / Education – The Emperor represents a stable career. No surprises, but no pitfalls. Promotions, if expected in your role, will come, but also a stable progression if you decide to start a new job. If you’re looking for a job, a junior position will work well. Romance – The Emperor in relationships again shows stability and a period of sameness. If you’re in a relationship, you’ll get to know each other on a deeper level. If you’re single and looking, now isn’t the best time to look for a completely new person. Maybe somebody you know has an interest in you. If you aren’t looking, time alone is all that’s needed. The Emperor sits alone on his throne considering bigger things. Friends – As above, The Emperor sits alone on his throne. Now might be a time to work on that project instead of going out with your friends. Don’t procrastinate with excuses. If you’re working with friends on a project, now might be a time to start a new aspect of it. Money – The Emperor and finance are a good combination. The stability means that investments will be okay, and generally you should be doing well with money. Money is just a tool, a concept, and it comes and goes. You have to recognise the transient nature of money. Health – The Emperor promises no surprises in regards to health. His conservative nature means little is going to change severely. Don’t worry about it. If you’re already ill though, you may be for a little while longer. As a ruler, The Emperor is looking to improve situations by traditional techniques. Don’t try anything holistic, stick to what is proven to help you. If in doubt, consult a doctor. Spirituality and Mentality – The Emperor has the wisdom of an experienced and wise Father. Sticking to your current spiritual path is the best deal for you. You may have already realised that all spiritual paths lead to the same God. A distinctly masculine card. The Emperor is represented as an ancient King, always bearded. Sitting on his throne, the rams shout ‘Aries’. His stone throne shows his time honoured, unwavering conservative values. The Empress is linked, and as their names show, they balance each other on the Male / Female divide. In his hand, he holds a stylised Ankh, an Egyptian symbol that has many meanings; mainly; “Life”, but also tying the card in more deeply with the Egyptian undertones that are present in the Tarot. In reverse, The Emperor takes authority to a new level. Expect misuse of power, or themes relating to somebody taking their control too far. The Emperor has absolute power. As well as signifying somebody else, it may also point to you. Are you acting within your bounds? Is it possible that you are infringing the rights and comfort of others? Looking for a Live Tarot Reading? We’ve selected live tarot readers to give you a FREE 3 Minute interpretation of The Emperor! Scroll through them below and pick your favorite one. FREE 3 minutes chat + 50% discount! New clients only. Credit card required. How was your Free Tarot Reading? Let us know in the comments below! © 2019 Tarot Explained. All right reserved.